Oil on panel, 66 x 97 cm. Ruisdael was only eighteen or nineteen when he painted this landscape. The sea has eaten its way into the coastline and created an opening in the forest landscape, where a curved path on a sandy cliff leads the viewer’s gaze into the painting. A house can be glimpsed amongst the trees, and up on the path and at the foot of the cliff, there are three tiny figures and some sheep. The scene unfolds across the shore like on a theatrical stage, and the landscape is the lead actor. The plot is scaled down to a minimum; the small animals and figures play only the role of sporadic staffage. The landscape is gloomy and sublime, but broken up by the light sand of the cliff as well as the birch trunks and the curved trajectory of the path. The dramatic impression of the sky is created through the alternation between heavy, grey-blue clouds over the landscape in the foreground and the sunlight on the clouds over the sea. Ruisdael was a Dutch landscape painter. He was the nephew of the landscape painter Salomon Ruysdael, whom the museum also houses a fine painting by. In 1648, Ruisdael was accepted at the Guild of Saint Luke, a collective of the nation’s best landscape painters. He primarily painted forest interiors, seascapes, river and dune landscapes, but also castle ruins and watermills. The palette is often dark in tone and the subject matter grand. 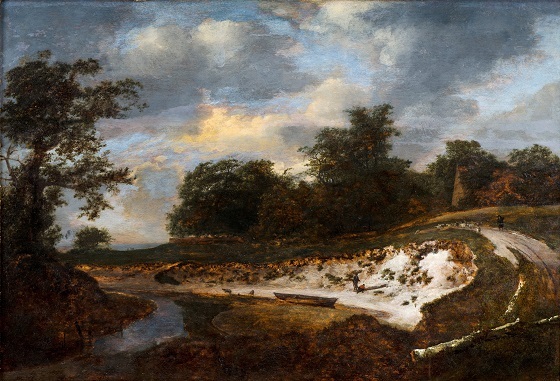 The interest in Ruisdael’s art quieted after his death, but reflourished around the mid-1800s, when the French philosopher Jean-Jacques Rousseau articulated his thoughts about man’s connection to nature and lauded its beauty and stillness. Ruisdael’s landscape painting would become significant for the Romantic landscapes of the English painter John Constable, among others.